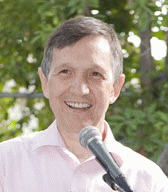 Kucinich: on Fire in California! Sat July 26, 2008. LOS ANGELES, CA. About 200 people sat under a tent in hosts Stanley and Betty Sheinbaum’s lovely yard, eager to hear Kucinich address the topic of Restoring Our Constitution. One couple had driven six hours from the Sacramento area to bask in the passionate Congressman’s fiery rhetoric. There was a visceral feeling of celebration: the afterglow of the House Judiciary Committee hearing the day before had permeated the gathering, like a welcome oasis of victory in a barren land. While Nancy Pelosi did agree to the congressional hearings, she still maintains that impeachment is off the table. Nevertheless, it is clearly out of the oven and still bubbling, ready to be served. And the LA Times, often reluctant to cover Dennis at all, ran a story about the hearings, referring to the Congressman as a rock star. 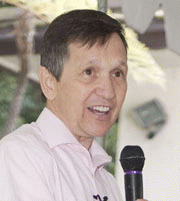 And then Kucinich was at the mike, opening his presentation with his familiar words of gratitude and appreciation, as he has done without exception every time I have heard him speak.